Some of the people in the kneeling in the corridor rolled their eyes while one or two nodded in agreement. The Marine waived his hand dismissively. Miles was about to say something when the door to the hangar bay opened and a medical team came rushing past with a patient on a stretcher. Some of the people in the corridor simply watched, others made the sign of the cross and others made other motions with their hands. The talkative Marine was one of them that made the sign of the cross. “He will make it through, I read his aura it is very strong.” Miles stated. Miles stood with the Marines, mostly to just get closer to the wall so he would be out of the way. “Move out.” The order was shouted and Miles pressed himself flatter against the wall and watched the Marines jog past him, but not so fast that he did not see the look of contempt coming from the two Marines they brushed past. Miles smiled no need for him to run, he was just going to get on his ship then back to the Star Digger, no need to hurry. He strolled in the direction of his ship looking around at the current chaos that was the landing bay, he counted two wrecked ships, Sharks he thought. A Traffic Control Officer stopped him and told him to move his ship the sooner the better. Miles nodded and continued towards his ship and pressed the ramp activation and as he looked around he noted the clean up crew scrubbing down the deck nearby with a laser brush. He walked over and looked over what they were doing. “You missed a spot.” Miles stated. Ten minutes later the same Traffic Controller’s Office stomped over. There were a few nods around the assembled group. “Refueling Tech if I have to tell you again I will write you up, now get your ship out.” The Ensign said more forcefully now. Miles walked away with the Traffic Control Officer glaring at him. He saw that the ramp had gone up again, he was about to push the button when the familiar whine began and the lamp lowered. “Lucy I am home.” Miles said going up the ramp. “Your presence is requested on the bridge Miles.” The general labor droid said as Miles closed the ramp. Miles stopped by the gallery on his way to the bridge and grabbed a sandwich along with a bottle of ice tea. He arrived on the bridge and slid into the copilots seat placing his sandwich on the console. “Do not place that sandwich on the console.” The words came out as a hiss. “Hey no mayo on this one, just some mustard.” Miles said defensively. Miles took another bite of his sandwich and began to strap in. He had barely strapped in when they began to move and even though he could not hear the chatter from Traffic Control because he did not have his headphones on yet he could Fahad was getting an earful. Miles could not help him space. “Its not technically ‘airspace’ it is the vacuum of space.” He shut up when Fahad gave him a sour look. Miles looked around at the panels and noted everything was set correctly and there were no current problems so he finished his sandwich and then sipped slowly on the bottle of iced tea as he watched Fahad drive the ship off the Aid Ship the Charles Drew. He put on his headphones but did not bother turning on the piloting channel instead he pulled up the internal viewing monitors and flipped through the channels. He found the Ensign laying face down in the Engineering section in a hastily hung hammock with an empty bottle on the floor underneath her. “How do you fall asleep face down in a hammock?” Miles asked out loud. “Is she alive?” Miles said looking for some sign of movement from their Commanding Officer. Fahad punched a button and a heart beat monitor was superimposed on the screen, the woman’s heart rate showed a steady seventy beats per minute. “When did you rig that up?” Miles asked. “Well in that case I have to go to the head.” Miles said as he started to undo his restraint straps. “No Miles I do mind, I have been sitting in this seat for the last two hours supervising the offloading and then waiting for you to return, I need to get up for a little bit, so you can just sit here and monitor the cockpit while I go back and get something to eat and use the head.” Fahad said getting up from his the pilots seat. “Don’t touch anything, just call me if something changes.” Fahad said leaving the bridge. “Technician One Fahad has plotted the most efficient course back to the Star Digger that is both direct and efficient, I am guessing that is what you mean by the best.” Candace replied. Fahad came back twenty minutes later. Miles was concentrating on the Curly who was having some difficulties with a pipe so he did not pay much attention to the returning pilot. “What did you do?” Fahad asked as he sat down in the pilot’s seat. “You changed the course I laid out.” Fahad said. “Just a little bit, if we slowed down we could watch a run on that bombing range on this moon.” Miles said reaching towards the navigation screen and pointing out the moon. “That is our job you donkey brained idiot.” Fahad said increasing his volume a bit. “It only adds about twelve hours to our course.” Miles said defensively. “Twelve hours, twelve hours.” Fahad repeated his face turning red. “Allah why am I being punished?” Fahad said looking upwards. Miles shook his head. “There is nothing wrong with me.” Fahad continued to stare at Miles. Miles waved a hand dismissively. “I am going back to get another sandwich.” He said unstrapping and leaving the bridge on his way out he heard Fahad talking to Candy changing their course again. Miles grabbed a sandwich and then wandered back towards engineering where he found the Ensign in the same position he had seen her in earlier. He sniffed at the empty bottle underneath the hammock and shuddered at the terrible odor. “Hey Ensign are you okay?” Miles said rocking the hammock gently. Nothing, well actually she was snoring very softly. Miles shrugged. “Huh?” Miles said waking up in his bunk. The ship shuddered and then the alarms started to go off signifying a ship wide pressure change. Miles made it up to topside ball turret while the alarms continued and the ship continued to shake. “What is going on?” Miles yelled strapping in. Luckily Fahad had already powered up the guns and Miles activated the targeting system. “Is the Ensign on the rear turret?” Miles said as he scanned the front area of the ship for targets. Miles looked around. Suit up, he had no idea where his space suit was. Lights began to flicker and his powered chair in the turret sputtered to a stop and the targeting scanner bipped off, unstrapping himself he climbed down and found and emergency locker where he pulled out an trauma suit which could double as a makeshift environmental suit in a pinch. “Abandon ship, abandon ship.” The voice of Candace came over all the speakers on the ship. Miles was about to start running for the closet escape pod when the gravity plates went out and he was slammed into the ceiling and everything went black. Fahad looked over Miles his vitals were good although from the readouts on the medical scanner the technician had a concussion. Served him right thought Fahad the guy was a terrible soldier with no sense of duty, the man was a horrible technician with no pride in any work that he did if he did any, and he was a worthless excuses for a human being who only thought of himself. Fahad shook his head. The ship had been falling apart, power was gone, back up power was blown out in fifty percent of the ship and the Alarians were still pounding the defenseless ship with occasional blasts. Fahad had found the Ensign first and stuffed him in an escape pod, he was still not sure if she had made it. Then he had gone back and found Miles, he was floating unconscious with the stupid makeshift environmental suit about to give out when he stuffed him into the remaining escape pod. “Most likely the Ensign is injured.” Fahad said, not bringing up the injury was self inflicted by a bottle of one hundred proof. Fahad was relieved that the Ensign was alive but then a little upset, if she was alive that meant she could command another ship, or at least still be an officer and with the limited positions on the Star Digger Fahad could be working for her again. Fahad looked over at Miles, worse than that he could be working with both of these fools again, Fahad shook his head . Fahad had two hours of blissful silence before Miles woke up. “Did anyone get the number of that truck that hit me?” Miles asked. “Did I ever tell you how I was adrift in the South Pacific in World War Two.” Mile said reaching for an emergency rations pack that was sitting in front of Fahad. Ana hated men. What she truly hated were lazy men, but since all men she had ever known were lazy at heart it really did not matter. Ana also hated lazy women but she had never known too many of them where she was from. Technician Duncan Foster her current partner was working very hard to avoid his fair share of this job, thus living up to her hard learned belief that all men were lazy and worthy of her disgust. Everyone in the fleet had said ‘The Phrase’. Everyone except Ana, Ana Meski had listened to the endless discussions and walked away from as many as she could. Now she was out here on this deep space weapons platform with Duncan and he was taking the discussion about ‘The Phrase’ to a whole new level and since no one else was around she could not deflect his conversation to anyone else. Ana was beginning to really hate Duncan on a personal level and he was reinforcing her observation that the men talked more about ‘The Phrase’ then the women of the Fleet. There it was, for the last six months if people had nothing else to do the same conversation came up again and again ‘no substantial impact on history’ and now the conversation was slowing down her work. Ana shook her head slightly and continued the secondary weld on the base of the weapon’s pivot arm as the satellite spun. Ana knew that Duncan had his fingers only an inch apart but continued the work, why did men think talking ever accomplished anything. “You are not listening to me.” Duncan said as he stepped right in front of the light from the shuttle blocking the her illuminated work area. That was the one thing about space, when working you needed all the light you could get. Duncan was not deterred and went on like he did not even hear her. “The point is the Outfitters took the wrong person, I am sure of that.” Duncan shot back. “You know what really ticked me off, I had just made the perfect pair of loaded dice and was going to ready to win big after the next pay day. ” His tone was angry but not directed at her but she inside her suit she cringed anyways. Ana was sure Duncan did not see it, being encased by the suit. “Can you please move out of the light.” Ana said motioning for him to move. Ana snorted she hated when people used her last name it felt like they were being condescending, then went back to running a scanner device over the weld. “According to the church records I looked up, I think they had a total of seven kids.” Ana said dropping he eyes and going back to scanning. Ana simply nodded, more likely her nieces would have learned to tap beer kegs, wipe down tables and avoid the grabby hands of sailors. The nod was hard to see in a Environmental suit but Duncan was looking directly at her so he saw the gesture. She got self conscious that he was looking directly at her, so she bent back down even though she was now done with the scanner. Duncan thought about it for a few minutes. “If they are equal magnitude they cancel each other out,” he paused as if the words were coming to him. “destructive interference.” He said this thoughtfully. Ana suspected he was having one of those unintended learning moments like she had just had. Ana looked over her comm panel with the to do list. “Duncan we really need to get these jobs done.” She said in a pleading tone. She focused her attentions back on the work list but was inwardly shocked. It was true she like working in the suits, no one could get to her, she was totally self contained and no one unless they wanted to really hurt her could touch her in her suit, also being in a suit meant she was outside and being outside of the ships meant not many people would be around and she could relax a bit. “Ana you okay?” Duncan said and realized she had allowed herself to be distracted, if she had done that around the tavern someone would have taken advantage of that distraction in some way; most likely a sailor coping a feel. “Yes I am fine. Can we get back to work.” Ana said strongly she hated that she was distracted by the past. The past was the past and out here in space she was better off than working in the tavern no matter how she had gotten out here. “Sure I guess so.” Duncan said sounding a little shocked at her tone. Ana spoke before she thought. “Do you see any wells around here that need dug, our water comes out of a machine which I not only know how it works but how to take it apart and fix it if it should break and I don’t see any horses out here, but if this shuttle breaks down I can break out my tools and I have a pretty good chance of fixing it. The Outfitters put the same knowledge in your head as they did mine so why am I at the top of our class and your are at the bottom so don’t give me that bull about women not being as good as men, and Nejem is not an American Indian she is from the South Central Asian the sub continent of India country called India so she is not a ‘squaw’ you dummy. Ana caught herself and then shook her head. “You have the controls, I have to use the bathroom.” Without waiting for him to answer she unstrapped and started to rise. “I know what you mean, I hate using the built in system in this suits but it does save a lot of time.” Ana was glad when the door closed behind her and Duncan was still talking about how fast it was to use the suit. Once by herself she locked the door behind her climbed out of her suit and hurriedly used the bathroom. Ana was thankful every time for these clean bathrooms and the way water just poured out of the faucet when she turned it one. She swore to herself she would always be grateful for the miracle of running water after all the time she spent cranking buckets up from the well in the back of the tavern. Before washing up she quickly ducked out of the bathroom and cleaned her suit with the standard towels and then plugged it into its charging unit, then she went back to the luxury of the bathroom with the wonderful hot and cold water. Ten minutes later she started to get dressed when the steady hum of the engines abruptly stopped, she pulled on her uniform top and stomped onto the flight deck. “Technician Duncan Foster what did you do?” Her eyes automatically took in all the instruments. “Nothing I swear I was just sitting here and all of a sudden our forward propulsion unit redlined and we stopped. Duncan seemed to sink down in his seat and looked up at her. “Nothing, I was just sitting here, I wanted to listen to some music, and I was scanning the database for one of my music selections, you know like they showed us.” He motioned towards the information database control. “Show me what you did.” Ana commanded. Duncan punched in the proper sequence and Ana watched him. Right before he was about to hit execute she saw a strange prefix next to his music collection and she caught his finger right before he activated the music. She highlighted the selection and on all the screens in the cockpit the voice and personage of Senior Technician Nejem appeared and started talking. “You have uncovered a special task in the competition, by activating a common music selection you have temporarily deactivated your engines but since you have found the extra line of code before beginning maintenance, thus showing extraordinary intuitive diagnostic skills no further delay will be assessed continue with your mission.” The hum of the engines returned and Ana quickly checked over the boards to see that their course had resumed. “No further software glitches will occur.” Nejem’s image faded from the screens and they returned to their normal displays of information. Ana smiled and wondered how many other people had found the glitch within moments of the test being initiated. She hoped Lee and Ruth took hours to figure out the software problems, they were the only ones close to her in scores coming into this competition for the Tech Two position. “See I told you I did nothing wrong.” Duncan said in a somewhat hurt tone. Jeff’s head was down thru most of the lecture she had just given, but during the last sentence it snapped up and he glared at her. “Don’t you think I know that. I mess up all the time, and people tell me all the time that I am messing up, now I am stuck with you Ms. Perfection.” Ana saw a tear come out of his eye. “I just want to go home where there is sky and dirt and horses and things I understand.” Jeff’s voice continued to rise but he remained seated. “What right do the all knowing and all powerful Outfitters have to pluck me out of my bed and bring all of us a couple hundred years into the future and say, there’s the bad guys, save the Earth.” Duncan said this last part with a hint of anger in his voice, which made Ana cringe. Ana tried to ignore him but the was getting personal. Ana slammed her hand down. “You know what I like about being out here. I like that I have clean clothes whenever I want them, I can eat plenty of hot food and I don’t have to sleep in a flea ridden bed with my youngest sister.” Now that she had uncorked her feelings it was like she could not stop. “All I could see for my life was the same thing that killed my mother, long days of working serving drinks to sailors and fighting off my father at night when he was drinking. You may have had a choice in your life I didn’t.” She said almost shouting. “I could drink chacha and kill myself slowly like my mother did leaving us to deal with our father on our own or I could have run away from my father’s tavern, but where would I have gone, into the streets doing God knows what to survive.” Ana was crying hot tears of anger now. “I thank God for the Outfitters I am free of that terrible miserable existence, I could not even read now I am fixing starships and if I have to kill a hundred or thousand blue skinned aliens as a way of thanking the Outfitters well then so be it.” She looked over a Duncan who had a look of shock on his face and then she ran into the rear portion of the shuttle craft. Ana sat in the rear portion of the ship for what seemed like hours, she cried and just when she thought she was finished an image of her sisters would leap to her mind and she would start crying, not that she missed them, but that it felt like she had deserted them by being glad the Outfitters had plucked her out of her home in Poti on the Black Sea. Poti, where the men smelled and the women could never get clean, thinking of what she had escaped made her happy that she was here. A simple ding brought her out of her pity party. The ding was the sound of the suit reaching its full charge which she knew only took an hour. She went to the bathroom and cleaned herself up, washing her face with a wonderfully cool wet cloth, then put a calm look on her face and went to the flight deck. Ana just nodded and went to the pilot’s chair and checked the board. One hour and twenty minutes till they were at the next test site, good Jeff’s suit would be fully charged. “Ana ?” Duncan said tentatively almost timidly. “Yes.” She said not looking up. “You said the word ‘chacha’, what is that? Ana glanced over at him. “Applejack? Is that something made from apples. 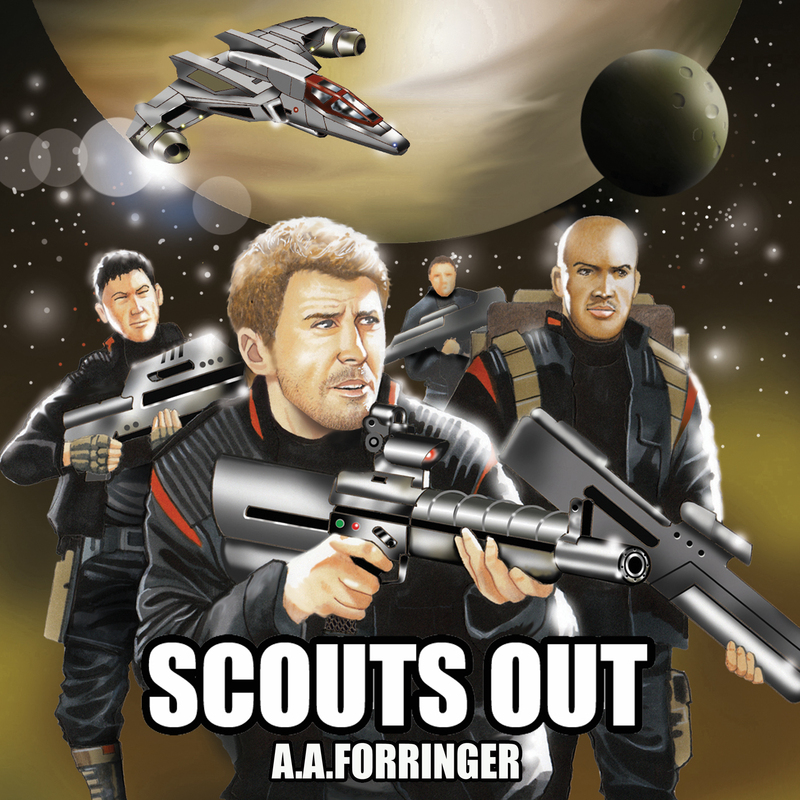 If you liked this story you can find my books from my Outfitters Universe at smashwords.com. If you look the right of this screen (and scroll up) you can click on the cover of each book. Right now you can read the books in order but I suggest Scouts Out, Disconnect and lastly Q Runner. Coming out soon (Dec 2016) will be Primary Collision, the 4th book in the Outfitters Universe, and the 3rd book in the Fleet Stories. Leo Grant and the crew of the Arrogant Lion (Scouts Out) have a large role in the book along with Shelby Pickett (from Disconnect).